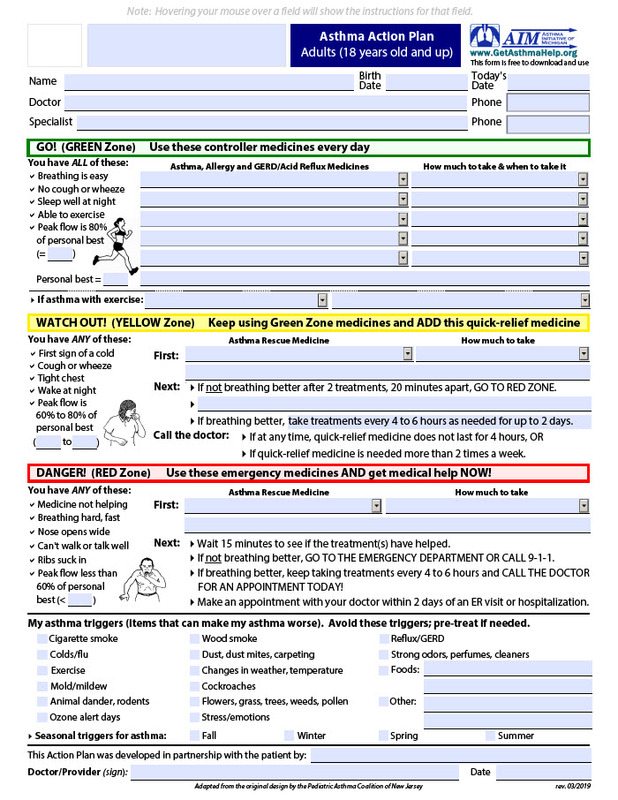 A written asthma action plan detailing for the individual patient the daily management (medications and environmental control strategies) and how to recognize and handle worsening asthma is recommended for all patients. It is particularly recommended for patients who have moderate or severe asthma, a history of severe exacerbations, or poorly controlled asthma. The written asthma action plan can be either symptom or peak-flow based; evidence shows similar benefits for each (EPR-3, p. 278). 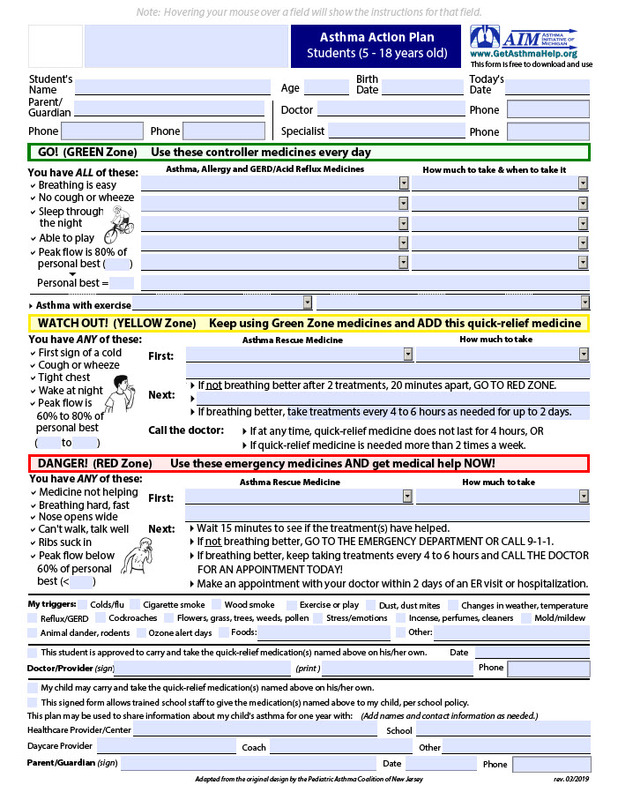 A written asthma action plan, developed jointly by the health care provider and the patient, will help the patient manage his or her asthma. There are many different asthma action plan formats. Some examples are included on this site. It is important make an Asthma Action Plan that works well for you! For Chrome and Firefox, you may be able to right click, download and save the pdf, depending on your version of Adobe Acrobat. More Download Information. Download the 0-4 Years Old Asthma Action Plan, Revised March 2019: includes age-appropriate dosing in drop down menus for guidelines-based asthma, GERD and allergy medications, triggers and parent permission to administer meds at school/daycare. If you download one or more of these e-AAPs, please use them and then provide us feedback using this survey, or sending your comments to info@getasthmahelp.org. Additional Electronic Asthma Action Plans – These action plans were prepared by the University of Michigan Health System. 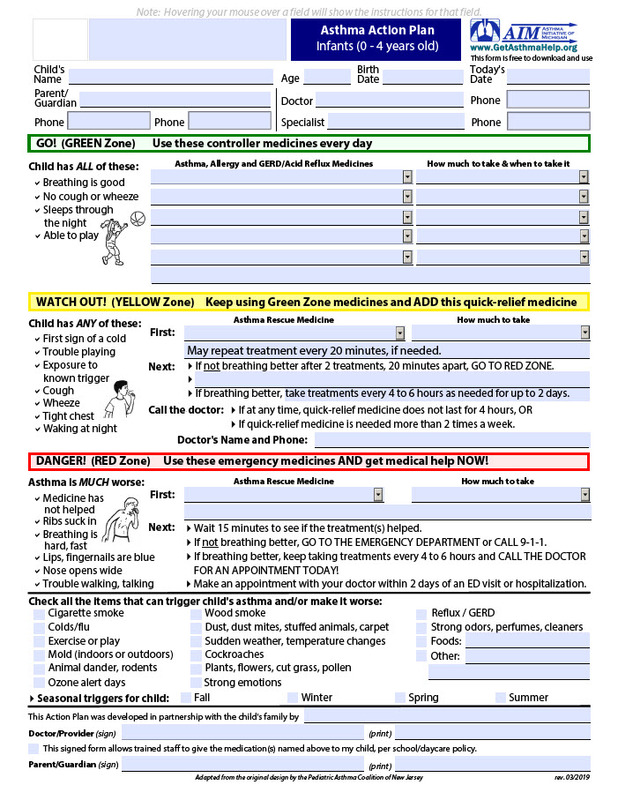 A two-page tool based on NAEPP Guidelines for asthma management with a short-term asthma action plan for patients being discharged from the ED. Listing of the patient's Peak Expiratory Flow (PEF) levels, including personal best PEF, and calculated PEF zones based on personal best. PEF monitoring is recommended for moderate to severe asthma only. A list of triggers that may cause an asthma attack. This can help inform others and the patient of what triggers to avoid. Provided to other contacts of the patient as needed. Adapted from "Guide to Improving Asthma Care in Oregon." Oregon Health Division, Portland, OR, September 2001.